Oktoberfest | Great Lakes Brewing Co.
A_Reddish amber with a thick white head that dissipates into a thin ring.Decent lacing. S_Mild malty smell. Picking up some hop profile. T_Malty,toffee,nutty. Some floral/piny hop notes.Bold but not overbearing flavor. M_Medium bodied,high carbonation,coats the mouth. D_Great drinkability. Just like a good oktoberfest should be. Appearance – This is a brilliant, crystal clear lager halfway between orange and brown with a nice, off-white head that left lacing on the inside of my pint glass. I don’t want to call the beer copper because that really doesn’t do it justice. I just couldn’t stop staring at it the color was so brilliant and perfect. Smell – No aromatic hops here so the bouquet is all malt, and man what a wonderful aroma this beer has. It’s toasty with a bit of whole wheat dough and very simple in the nose which is just as it should be. The smell rightfully lacks sweetness which is a big mistake among American brewers of the style. Taste – This is phenomenal. The flavor picks up some hops but mostly it is an incredible mix of malts, and again the sweetness typical of many pretenders of the style is all but absent. The malt is raw and slightly doughy with a slight uncooked biscuit character supplemented with mature, unsulphored cane molasses, second molasses if not the third boil. Mouthfeel – This is shy of medium in the body and pleasantly flat to mild with a teasing bitterness that begs for sausage and mustard. It’s a bit rougher than other versions that I’ve had but really hit the spot. Drinkability – This is easily the best Oktoberfest beer manufactured in the US that I have ever had the pleasure to consume. It’s simple, straight to the point, on style, and literally transported me back to Munich. A: Caramel orange coloring, dark, with a nice movement of effervesce within. Tan head is creamy smooth, 0.5 inches with a good hold. Thick band lacing, very good to style. S: Fresh wet noble hops, nice strength, sweet toasty malt. Fresh barley, candy-orange and apple fruitiness. T: Flavor was earthy noble flowers with a deep lush malting. Nice toasty speciality grains, apple peel, sweet caramelized grains that finishes lightly dry with some earthy leaves. M: Sticky full body, syrupy feel, a good carbonation backing. O: Not many octoberfests have the lush malt depth and earth hop appeal this has. Nice toasty backing, flavorful with an ideal drink-ability. Full, a bit heavier then your typical German counterpart, but one that still can throw back. outstanding overall. Great copper color. Tastes great cold, but really comes alive as it warms. A slight metallic spiciness that for some reason I don't find off-putting but actually look forward to in this beer. Malts are not overwhelming or cloying. Pairs really well with spicy wings. My favorite Oktoberfest. Very similar to its cousin Eliot Ness. Oktoberfests are among my all time favorite beers. This offering has nothing wrong with it, but also doesn't stand out. It doesn't have the sweetness of Sam Adams version nor the suitableness of Augustiner. If it were the only one available, I would drink it, but I can't imagine telling anyone else - "you have to try this!" The lacing makes a spectacle of it's self, copper clarity is stunning. Clean malty nose of toasted bread with some spicy hop too. Smooth and a bit creamy with a delicate medium body. Malt is quite complex with fresh baked bread, dried hay and a hint of caramel. Spicy hop bitterness is there from start to after taste. Dry finish and the flavor lingers slowly away. Seriously great beer here. One of the top picks for O-fests. Are you f***ing kidding me ? I think it's time to stop reading these reviews and hoping to get anything inciteful from them. It is very apparent that most of the Beer Advocate reviewers are all hopheads. This beer is NOT indicative of a true Munich Marzen/Oktoberfest beer. The best way I can describe it is: half marzen/half I.P.A. Just like all of GLBC beers, it is WAY too hoppy. Nicely balanced ? I was not able to detect any malt flavor. Malty, slight hops ? What are you comparing this to ? For what they charge for a 6 pack (around $8), I'll stick with a real Oktoberfest beer from Munich, which I can buy for less money. I'll take the Hacker-Pschorr (which I buy in kegs) or the Paulaner any day. Please try one of these beers for a true example of the style. The Spaten, H-B, Augustiner and Lowenbrau are also good but I prefer the amber colored style. I live in Cleveland and always shake my head at all the raves about Great Lakes. Eg. their "dortmunder gold" is NOT a dortmunder/ export beer at all. Try a DAB or a DUB instead. Is there a site for malt-heads ? Poured from a 12 oz bottle into a pint glass at approximately 45 degrees F.
A: Pours a coppery clear golden-orange, which forms a thin head that dissipates quickly into a ring of bubbles around the glass. S: Doughy, yeasty malt, much like an uncooked biscuit, with some faint spice hints and a touch of non-sweet caramel. T: Sweet toast and a bit of caramel hit up front, followed by a doughy yeastiness that rounds out and balances the sweetness nicely. There's some faint spiciness to this marzen, like a touch of cinnamon. As could be expected in any malt-forward lager, there are some undertones of toffee and caramel, though with decidedly less sweetness than one might expect. 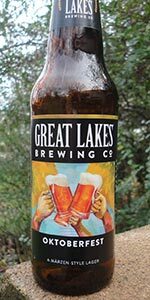 The finish is composed almost entirely of the GLBC yeast, with a slightly grassy, leafy tone. M: Flat, but in precisely the way a marzen should be, with minimal carbonation. The feel across the palate is light, without a watery finish (GLBC is good at avoiding that issue with every beer of theirs I've had). O: That's a good, tasty marzen, relying on malt and yeast to provide the bulk of the flavor profile, while spice and hops remain comfortably in the background. This is a top rated Oktoberfest? Sorry it really missed the mark with me. I have 5 more to try and maybe if I start with one of these it will be better. A real funky aftertaste that all I can compare it to is what a musty basement would taste like. Like I said I need to try another and maybe my taste will change but for now, very disappointed. Pours a soapy, off-white head. Spicy hop nose. Light, golden-copper color. Starts with hop bitterness and caramel. Builds in caramel and malt after a flash of medium bitterness. Finish is lingering caramel on spicy hops. I am not digging the caramel aspect of this one, it really ruins it for me. Great spicy hops, though. One of the better if not the best Oktoberfest I've had. I don't love this style and only have a few each year. Good malty bread like balance to this one. taste - malty with a hint of smoke rounded out by minimal hopping. The 6.5% alcohol was not present in the flavor. drinkability - A good representative of the style. It is a bit malty for an every day beer but it tastes pretty good on a cool fall day. This is yet another in my select tour of Oktoberfests for 2008. Oktoberfest from Great Lakes Brewing Co.